Home » Main Dishes » Category archives "Italian"
Nutty and buttery Pecan-Crusted Chicken and Tortellini with Herbed Butter Sauce is your winning solution to getting dinner on the table in 30 minutes. Meanwhile, sprinkle chicken with salt and pepper. Place pecans in a shallow bowl. Place egg in a second bowl. Dip chicken in egg mixture, allowing excess to drip off. Dredge chicken in pecans, pressing firmly to adhere. Cook chicken in hot oil in a large nonstick skillet over medium-high heat 2 minutes on each side or until done. Remove from skillet; wipe skillet clean. Melt butter in skillet over medium heat. Add garlic, and sauté 5 to 7 minutes or until garlic is caramel-colored and butter begins to turn golden brown. Immediately remove from heat, and stir in basil, parsley, and hot cooked tortellini. Sprinkle with cheese. Serve immediately with chicken. Pecans aren’t just for dessert. Try them toasted in this Italian-inspired fettucine with fresh basil and Asiago cheese. Heat pecans in a small nonstick skillet over medium-low heat, stirring often, 6 to 8 minutes or until toasted and fragrant. Meanwhile, melt butter with olive oil in a large nonstick skillet over medium-high heat; add zucchini and garlic, and sauté 3 to 4 minutes or until zucchini is tender. 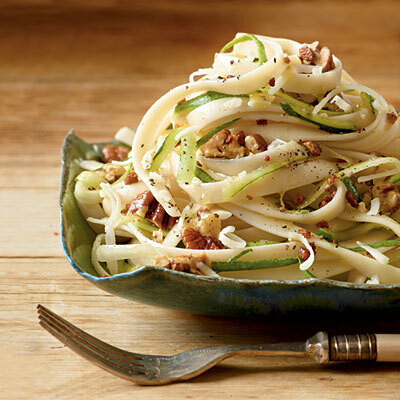 Toss with hot cooked fettuccine, pecans, Asiago cheese, and basil. Season with salt and freshly ground pepper to taste. Serve immediately. 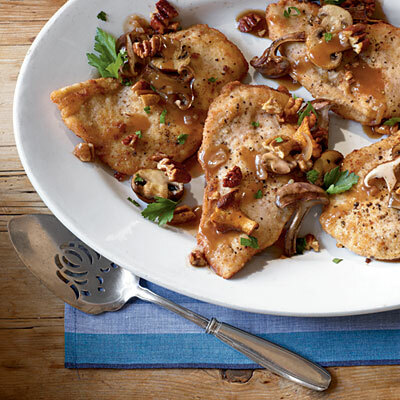 We added buttery toasted pecans and even dredged the chicken in a pecan mixture for extra flavor and texture in this Chicken Marsala recipe. The results are amazing! Melt 1 Tbsp. butter in a small nonstick skillet over medium-low heat; add 2/3 cup pecans, and cook, stirring often, 4 to 5 minutes or until toasted and fragrant. Process flour and remaining 1/3 cup pecans in a food processor until finely ground; place flour mixture in a large shallow bowl. Place chicken between 2 sheets of heavy-duty plastic wrap; flatten to 1/4-inch thickness, using a rolling pin or flat side of a meat mallet. Sprinkle chicken with salt and pepper; lightly dredge in flour mixture. Melt remaining 2 Tbsp. butter with olive oil in a large nonstick skillet over medium-high heat; add chicken, and cook 2 to 3 minutes on each side or until golden brown and done. Remove chicken from skillet. Add mushrooms and shallots to skillet; sauté 3 minutes or until mushrooms are tender. Add broth and Marsala to skillet, stirring to loosen particles from bottom of skillet. Bring mixture to a boil, reduce heat to medium, and cook, stirring occasionally, 5 minutes or until sauce is slightly thickened. Return chicken to skillet, and cook 1 to 2 minutes or until thoroughly heated. Transfer chicken to a serving platter; spoon mushroom-Marsala mixture over chicken, and sprinkle with parsley and toasted pecans.